This Col-Met Booth intakes fresh air from the cleaner upper levels of the shop through a filter bank in the booth ceiling. The filtered air is drawn down and away from the vehicle through exhaust filters at the floor level, along both sides. This provides efficient overspray control that reduces prep time and also provides a much healthier workplace environment without an expensive downdraft exhaust pit. When purchased as a pressurized unit, the booth can be equipped with an air replacement unit and cure cycle to meet your requirements. It is available in both drive-through and solid-back designs. Bright full booth illumination is provided by ten four-tube, 48″, 32-watt, fluorescent light fixtures in the angled ceiling panels and side walls. Each is sealed behind clear, tempered safety glass. All fixtures are UL listed and approved for their intended use and placement. The light tubes are with the fixtures. 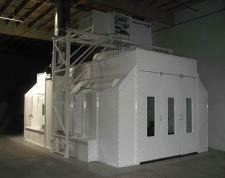 Col-Met Spray Booths comply with all applicable OSHA and NFPA regulations.